Hey all! Noelle this time! I haven’t written much in this blog yet – blogging is something that I am still getting used to. I email and facebook so often that blogging never really occured to me. But I think I can get hooked on it! So, as many of you know, we have made it to China. Just to back track a bit for anyone who might be wondering why we are here, we were going to join the Peace Corps. However, after some consideration, we decided it wouldn’t be the best fit for us and our future goals and plans. We still wanted the abroad experience though so we hooked up with an agency that helps teachers find jobs overseas, and wahoo! We are here. 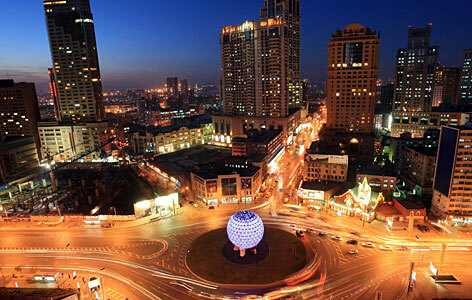 We are in the northeast section of China, in a city called Dalian. Being in a city has brought on some unexpected challenges for me. One of these challenges just happens to be the overly crowded population in China. I can’t lie – I don’t like the crowds and probably will not get used to them during my time here. Going into a store and barely being able to move around, plus enduring temperatures that feel like 100 degrees due to the excessive amount of people and lack of air conditioning is not what I am used to when going on a simple trip to the grocery store. Also, walking through downtown, there is an exhaust smell that is almost nauseating to me every time I walk through. I am REALLY HOPING this is something that I get used to quickly. Because, you have to remember, I’m a nature-lovin girl, not a city girl at heart so I’d much rather be smelling fresh cut grass than anything in the city. Since I have described some of my not-so-good experiences so far, it is only fair that I tell you the good! There’s always a good side! Get used to the smell kiddo’, China is at least three generations behind us in their environmental concerns. Just look at the amount of pride they take in that disaster in the Three-River gorge.